Big News! Time to Celebrate! For the past month, I’ve had some big news that I’ve been waiting to share. A month ago, I learned that the talented Nadine Brandes has agreed to professionally edit Dare! 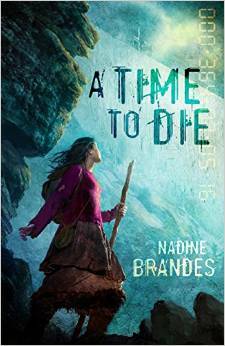 Nadine Brandes’ first book A Time to Die released earlier this month in ebook and paperback. You might remember seeing my blog post If I Had One Year to Live as part of her blog tour. I stumbled onto Nadine Brandes almost by accident. I had recently read Jill Williamson’s By Darkness Hid. It was both fantasy and Christian, a combination I hadn’t seen often. I looked up the publisher: Marcher Lord Press. I quickly learned that Marcher Lord Press had recently changed its name to Enclave Publishing, a publisher focusing exclusively on Christian speculative fiction. I browsed their list of books, reading the blurbs about each of the books and visiting each of the author websites. I also read through Enclave Publishing’s blog and came across a guest post by Nadine Brandes. I followed the link to her blog, and I guess the rest is history. After visiting her blog obsessively and waiting eagerly for her book to release, I finally gathered my courage to see if she would edit my book as part of her editing services. And she chose my book to fit into her busy schedule! Mine! To celebrate both this opportunity and the release of Nadine’s book, I’m giving away either a paperback or ebook copy of her new book A Time to Die. Just follow the directions below! The winner will be announced on October 17! The funny thing is, I found out about Marcher Lord/Enclave from Jill’s books as well, since I own all of them, lol. I wish I owned all of them! I got By Darkness Hid for free on Kindle, but I rented the other ones from the library. Thanks sista!! 🙂 I enjoy your blog! I discovered author blogs this year…and now I can barely keep up with all the new books I’m learning about! That’s neat that you go out of your way to support Indie authors. She’s been very helpful so far and I’m more than happy to get the word out about her book. I can’t wait to actually read it now that I got my copy in the mail today! I finished A Time To Die a couple days ago…. excellent book! I bought the e-book version because I couldn’t wait for the few days until it came out in paperback, but definitely need the paperback (signed? :-))! I managed to hold out for the paperback, but it was a long wait. I just got my copy today. 🙂 I may have been shrieking and jumping up and down! Yay! A new author (you!) For me to enjoy! I find new books to read through word of mouth and social media. Since I’m not published yet, you won’t be able to read a book from me quite yet, but I hope you enjoy the blog! I find new books many different ways. It seems I’m always on the lookout. Recently, I’ve been discovering a lot of books through recommendations on blogs or podcasts. So have I! I discovered that many of my favorite authors recommend other authors in the same genre, so I tend to track those down. I’ve also discovered that I love WordPress’s reader feature for following all the blogs! I find new books to read through recommendations from my sister and son! They like the same kind of books I do, so we share a lot! I get a lot of recommendations from family members too! We tend to share books a lot.